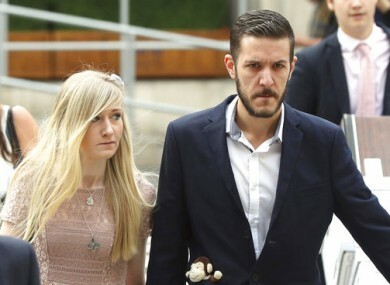 Charlie Gard's parents Connie Yates and Chris Gard arriving at court today. AN AMERICAN DOCTOR testifying in the case of a British couple seeking the right to take their critically ill infant to the United States for treatment said today it was worth trying an experimental therapy that had only recently emerged. The doctor, whose name and institution cannot be named because of a court order, told Britain’s High Court that new clinical data has emerged about the effectiveness of the treatment proposed for 11-month-old Charlie Gard, who suffers from a rare genetic condition and is on life support. The family is locked in a legal battle with Great Ormond Street Hospital because they disagree on whether trying the experimental treatment is in the best interest of Charlie. The case attracted international attention after President Donald Trump and Pope Francis weighed in. “We have a much better understanding of the data,” the doctor testified, saying the information has emerged in the time since judges first rejected the parents’ bid to take him to America. Charlie suffers from mitochondrial depletion syndrome, a rare genetic disease that has left him brain-damaged and unable to breathe unaided. Specialists at Great Ormond Street Hospital have fought the parent’s bid for therapy because they don’t think it will help and may cause him pain. The hospital says Charlie should be allowed to die with dignity. A succession of courts has backed the hospital, but the case returned to the High Court today after claims of new evidence and the high-profile interventions. The US doctor estimated the chance of “clinical meaningful success” for an improvement in Charlie’s muscle use to be at least 10%, but offered no conclusion on whether the infant’s brain function would improve. The treatment, known as nucleoside therapy, is not a cure. The doctor said he’d be willing to travel to Britain to see the child. Two hours into the High Court hearing, questions from Judge Nicholas Francis prompted tensions to boil over. Charlie’s mother Connie Yates shouted out, accusing Francis of misquoting her earlier statements about her son’s quality of life. “We said he’s not suffering and not in pain,” she yelled. “If he was we wouldn’t be up here fighting.” Chris Gard then slammed his water cup down and the couple left the courtroom. The couple returned after a break. The judge offered a reassuring word, acknowledging that the situation was desperate. “I understand you walking out,” he said. Francis, the judge who ruled in favour of doctors in April, has said he will consider any new evidence. The courtroom was packed as he heard arguments on differences of medical opinion. The hospital, meanwhile, offered an unapologetic defence of its decision in a submission to the High Court. The hospital’s solicitor, Katie Gollop, wrote that while the institution understands that Charlie’s parents believe they alone have the right to decide the treatment for their son, the hospital is bound by different principles. “A world where only parents speak and decide for children and where children have no separate identity or rights and no court to hear and protect them is far from the world in which GOSH treats its child patients,” the hospital said. Email “'If he was suffering we wouldn't be up here fighting': New evidence in Charlie Gard case”. Feedback on “'If he was suffering we wouldn't be up here fighting': New evidence in Charlie Gard case”.